Asymmetric Laplace CDF with m = 0. In probability theory and statistics, the asymmetric Laplace distribution (ALD) is a continuous probability distribution which is a generalization of the Laplace distribution. Just as the Laplace distribution consists of two exponential distributions of equal scale back-to-back about x = m, the asymmetric Laplace consists of two exponential distributions of unequal scale back to back about x = m, adjusted to assure continuity and normalization. 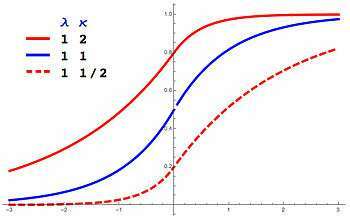 The difference of two variates exponentially distributed with different means and rate parameters will be distributed according to the ALD. 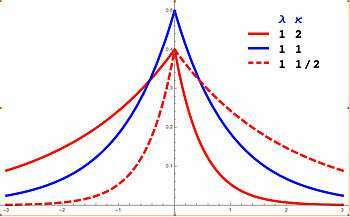 When the two rate parameters are equal, the difference will be distributed according to the Laplace distribution. Here, m is a location parameter, λ > 0, is a scale parameter, and κ is an asymmetry parameter. When κ = 1, (x-m)s κs simplifies to |x-m| and the distribution simplifies to the Laplace distribution. The ALD has the maximum entropy of all distributions with a fixed value (1/λ) of where . ↑ Kozubowski, Tomasz J.; Podgorski, Krzysztof (2000). "A Multivariate and Asymmetric Generalization of Laplace Distribution" (PDF). Computational Statistics. 15: 531. Retrieved 2015-12-29. ↑ Jammalamadaka, S. Rao; Kozubowski, Tomasz J. (2004). "New Families of Wrapped Distributions for Modeling Skew Circular Data" (PDF). Communications in Statistics – Theory and Methods. 33 (9): 2059–2074. doi:10.1081/STA-200026570. Retrieved 2011-06-13.